Canadian Customers: We do not charge import duty, so you will be responsible for those fees on receipt. 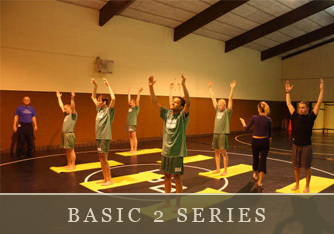 The instructional DVDs that can be used with VIYM® guide the practitioner through an informed yoga practice. 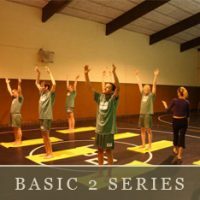 The Basic 1 and 2 Series leads the student first through an explanation of the mat and its layout, and then moves into centering and pranayama, warm ups, a posture sequence and ends in guided relaxation over a period of about 50-60 minutes. Watch and listen to Tracy as she uses the mat's features to orient and align her body as she demonstrates the yoga pose: Knee Down Spinal Twist. Video length 2:37. View Video. Watch and listen to Tracy as she uses the mat's features to orient and align her body as she demonstrates the yoga pose: Thread the Needle. Video length 1:35. View Video. Watch and listen to Tracy as she uses the mat's features to orient and align her body as she demonstrates the yoga pose: Triangle. Video length 3:55. View Video.